Looking for a Used Crosstour in your area? CarGurus has 532 nationwide Crosstour listings starting at $6,680. If you want the reliability and quality of an Accord, but need a bit more room for bulky cargo, the 2014 Honda Crosstour is worth a long look. The Crosstour isn't a full-fledged station wagon or SUV, it's like an elongated hatchback Accord, and it's definitely unique. The Crosstour was introduced in 2012 and underwent some major changes in 2013. There were exterior styling tweaks, interior material upgrades, added safety and technology features, and a revised V6 powertrain. After making all those modifications last year, Honda decided to leave the Crossover alone for 2014. While you can get into a base Accord for about $5,000 less than a base Crosstour, the prices get closer together as you move up in trim level, and you can get a lot more stuff into the Crosstour. The Accord offers 15.8 cubic feet in the trunk, while the Crosstour has 25.7 cubic feet of space behind the rear seats and delivers 51.3 cubic feet of room with those seats down. The Crosstour also rides a few inches higher than its sedan cousin and has a touch more headroom in the front seats. The Crosstour comes in two trim levels, EX and EX-L, and each of those is available with either a 4- or 6-cylinder engine. The 4-cylinder option is an inline 4-cylinder (I4) that produces 192 hp and 162 lb-ft of torque, is mated to a 5-speed automatic transmission and gets 22 mpg city/31 highway. The 6-cylinder choice is a V6 that generates 278 hp and 252 lb-ft of torque, comes with a 6-speed automatic transmission with paddle shifters and gets 20/30. Front-wheel drive comes standard, but the EX-L V6 has a 4-wheel drive option that changes the mileage to 19/28. The I4 provides ample power, but the V6 does deliver a bountiful boost and doesn't detract much from the efficiency. The steering is true, the handling reliable, and the ride quiet in the Crosstour, but since it weighs 300 to 500 pounds more than the Accord and is about 4 inches taller, it doesn't have the same nimble feel as the sedan. Standard features on the Crosstour's EX trim include cruise control, foglamps, power moonroof, heated mirrors, 17-inch alloy wheels, keyless entry, an 8-way power driver's seat, steering-wheel-mounted controls (audio, phone, cruise), Bluetooth, rear-view camera, air-conditioning, 60/40 split-folding rear seats and a 7-speaker audio system with auxiliary jack and an iPod/USB interface. The EX V6 upgrades include dual-zone automatic climate control, enhanced rear-view camera, lane-departure warning system, keyless ignition, 18-inch wheels, 4-way power passenger seat, intelligent Multi-Information Display (iMID) with 8-inch screen (includes SMS Text Message function), Bluetooth streaming audio and a premium sound system with Pandora radio. The EX-L trim includes all the EX V6 features (except the keyless ignition and 18-inch wheels) and also adds a forward collision warning system, exterior mirrors with memory, leather upholstery, heated front seats, driver's seat memory and an available navigation system with voice recognition and hard disk drive that includes 16GB of storage for audio memory and Song by Voice feature. The EX-L V6 has all the EX-L features plus keyless ignition, 18-inch wheels and the HomeLink Remote system. All Crosstour trims come standard with Honda's Vehicle Stability Assist with traction control, antilock brakes with electronic brake distribution and brake assist, tire pressure monitoring system, dual-stage front airbags, side curtain airbags with rollover sensor and active head restraints for the front seats. 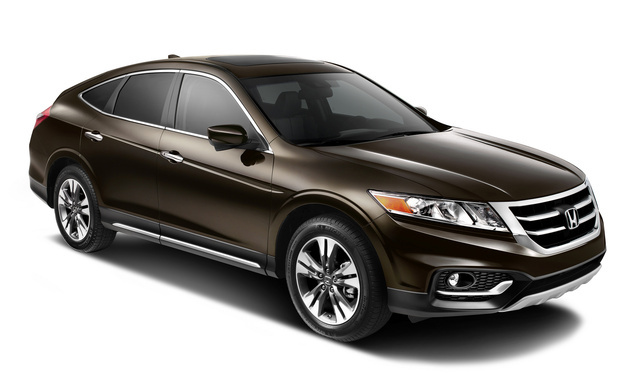 What's your take on the 2014 Honda Crosstour? DanielN I have it and I love it. It is beautiful, roomy, comfortable, quiet, exceptionally smooth ride, no need to slow down on turns. Rapido1 Had mine 10 days now, and I love it! Peppy engine, good suspension and quiet ride. Very elegant and comfy interior. I do not like the stock wheels, have ordered aftermarket bright silver painted wheels. I needed something bigger inside for clients than a sedan, but did not want an SUV. The Crosstour is the perfect medium. Plus it's looks spark a lot of conversation! 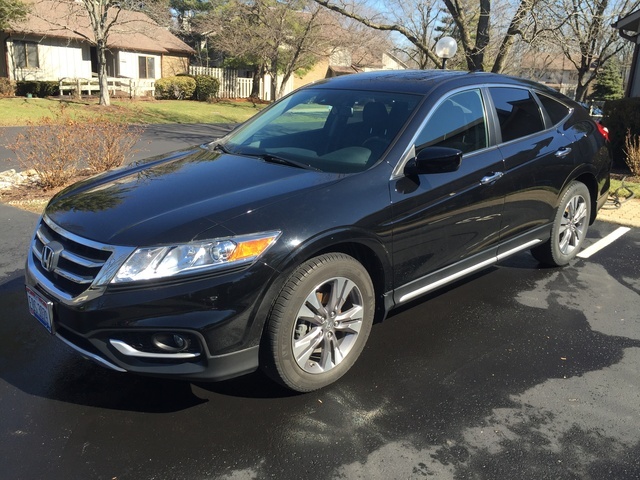 Have you driven a 2014 Honda Crosstour? When the doors are open, the vehicle remains dark inside which is unsafe. Which button or other should I activate to remedy this?